Welcome back to my blog. Or, if you missed the previous thrilling installment, welcome to my blog (and please read the previous one -ed). Hopefully you’ve got Dropbox installed and are sleeping well at night while your hard disk ponders how much longer its got left in this world. Now lets get down to something interesting, writing. Mind if I put on some Duran Duran? Duran Duran? You don’t look that old. They’ve got a new album out. Well, ok. As long as you don’t turn it up too loud. In the meantime, I’m going to talk about Scrivener. In fact I’m going to talk about Scrivener for quite a few posts, so brace yourselves (talk? More like ramble on -ed). Scrivener is a Mac program, and in the interests of full disclosure, I like Macs. Scrivener is being ported to Windows (in beta at the moment). I’m going to talk about the Mac version, but from what I’ve seen, the Windows version is pretty similar. Ok, lets start out with the summary. Scrivener is an excellent tool for writers of both fiction and non-fiction. It’s intuitive, powerful, and allows you to focus on your work, not on the program. That probably sounds like a bunch of sales stuff, but its true. 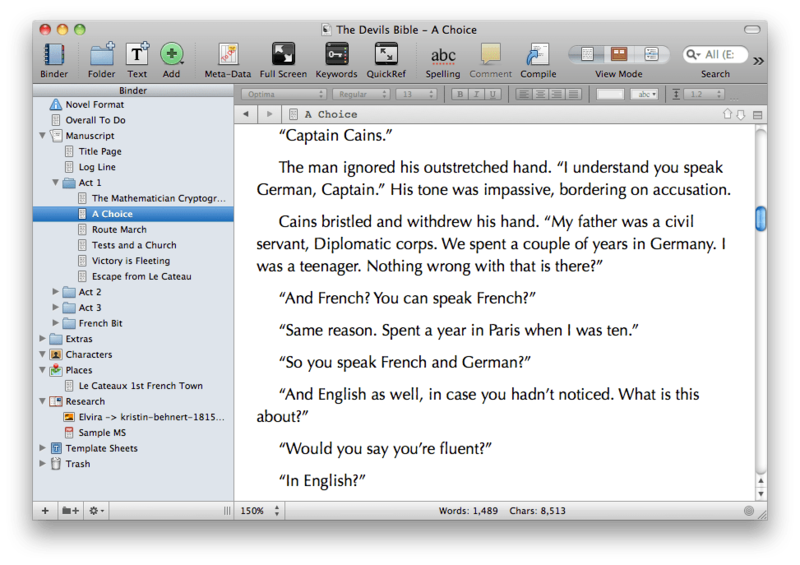 Scrivener (for the Mac) is basically developed by one guy. It’s been a few years since the first version came out. He doesn’t keep stuffing it with features, which is good because it means you don’t get a continuous string of changes. After several years he’s just released version 2.0. Version 2 has a few extras and has a more coherent feel, but the basics that made it great in the first place are undisturbed. The level of integration and the ease of use probably means the underlying code went through a lot of changes. Time well spent. If you want to try the program, there’s a trial version. You’ll have to splash out $45 for a full license. Cheap at twice the price, but don’t tell the sales people. Let’s look at the basics here and go over some of its other abilities in the next few posts. When you open up Scrivener it presents you with a dialog box to choose a template. Templates can’t be changed afterwards, so choose carefully or you’ll trash your life’s work. Just kidding. About the life’s work, that is. Templates are only an initial layout. Five minutes playing with the options and you can change from one to another. Let’s start with “Blank.” You chose where to save the file (in your Dropbox folder if you’ve got any sense and read my previous post). Draft, Untitled, Research and Trash. Nigel, that sounds like the review of your last piece of work! Er, maybe … but let’s no dwell on the past, eh? On the left is the Binder (aka an outline) and on the right is a document editor. If you’ve got this far though life and can’t guess what the document editor does you probably shouldn’t be left alone with a mouse, let alone a keyboard. The document editor comes with all the usual word processing do-hickeys, spell check, dictionary, bold text and all that jazz, but really, IGNORE IT and just type in your text. You’re writing a book, not laying out the latest issue of Ludicrously Expensive Designer Weekly. Yeah, I hear you, I like the glossy pics too, but you’re writing a book, you know, with text. Don’t Panic (to quote the late Douglas Adams). This is the corkboard view. We’ll go over that later. Just go to the menu, click “View” then “Scrivenings” and you’ll be all set. So lets talk about the Binder. This allows you to structure your WIP into sections. You can have folders and text sections. You can nest folders and place text section in them. You can nest text section, but that seems like overkill. In the example below I’ve set up three acts, with a folder for each, then nested the chapters within the acts. I could have broken the chapters down into smaller sections, scenes maybe, but I’m a chapter at a time sort of guy. Great Nigel, I write my epic in “sections”, rather than one whole document. I thought you said this was “an excellent tool?” It’s not exactly overwhelming me with its coolness at the moment. Right, well, you asked for it. Let’s say you want to move chapter 9 to before chapter 4 in your “whole document.” Off you go. Ok. I scroll up and down to find chapter 9. Scroll through the chapter selecting it. Scroll back to find chapter 4. No, wait, I need to re-number. 4, 5, 6, … won’t be a minute … 40, 41, 42, … Chapter 47. 1 minute 46 seconds. I was timing. Now it’s my turn. I click on chapter 9 in the binder and drag it to between chapter 3 and 4. Ta-da. I’m done. 8 seconds. All right, all right, maybe 9. Either way lots quicker than 1 minute 46. Scrivener re-numbers the chapters automatically. And I admit, you can re-number things in Word (etc), so that might shave 58 seconds of the whole document time, but Scrivener still wins. Not only can you move stuff around quickly, but you can refer back and forth equally easily. When you click on a text section in the binder the document editor returns the point you left off in that section. No scrolling around trying to get back to where you started. This works between editing sessions as well. You’ll notice in the binder I also have other sections. Extras, Characters, Places, Research, for example. You can create lots of other folders to contain related information that is not your manuscript, and keep it all in one place. When you come to generate your finished book, you choose what goes into it. The process of generating your novel from Scrivener is called Compiling. When you compile your novel, there are lots of options to control how it looks and its format. Double-spaced courier 12 point – no problem. Single-spaced Times 14 point – a couple of clicks and again, no problem. Word format – no problem. PDF, epub, Kindle and (gasp) plain text – no problem. All these changes can be done from a single screen by choosing you options and clicking “compile.” I’ll go over the whole compiling process in another post. Ok, that’s it for now. We’ll go through the more important and useful abilities of Scrivener over the next few posts. In the meantime, download a copy, try it out and let me know what you think. Also, if you’ve got a favorite writing program (PageFour, WriteRoom etc), let us know. You can even mention why Word is the greatest novel writing tool in the history of mankind (and I promise not to laugh. Much). I use Scrivener, not Mac, but Windows Beta for like 1 week. Don’t scowl at me :), I’m a computer geek for 27 years and I use the PC for a lot of things. I’ve tried other writing assistance software, however, Scrivener won the competition. I use spreadsheets (yeah, it’s an addiction) for all the auxiliary files I need to support an outline and the actual writing file. I needed a database to have everything organized and available in one space, not to open and go through open files all around. Also, I needed to get rid of the handwritten note cards, which I fill with information and sit all over my desk (and usually, I have to flip through all of them to find something, if I haven’t lost any of them that is 🙂 ). I’m very pleased with Scrivener, I have an editor, a database, a writing tool and an organizer at the same time with other features too. One important thing: I like the interface and that it is user friendly. Very important features for users. And I love the name generator. The only thing that I would like more, would be a title generator too (but that’s the greedy side of me). Hi Irene. Thanks for stopping by and leaving a comment. I promise not to scowl at you, even if you do use a PC! I hope you realize I’m joking about PC vs Mac thing. I prefer Macs and I do understand that lots of people prefer PCs. I was like you, with lists and spreadsheets and web pages saved all over the place. I tried quite a few different writing tools, but as soon as I used Scrivener, it just clicked. I’ve been using it happily for about 4 years now, with only a small break when I was Mac-less. I haven’t really used the name generator in anger because I’ve settled on the ones for my current wip, maybe the next one.